I'm already thinking about salads. It's usually some point in July when all I want to eat is salad, but the mood might have started early this year. Or, maybe this is just a way of planning ahead. I'll have one more go-to salad when the heat of summer has gotten serious. Either way, this is a healthy, light meal with big, bright flavor. The dressing is a puree of diced, fresh mango, cilantro leaves, mint leaves, curry powder, white wine vinegar, and olive oil. It seems much more rich and decadent than it is since the thickness of the dressing comes from the mango. The idea came from the book Power Foods which is full of dishes like this that have great flavor and are good for you at the same time. I made a slight change to the dressing recipe. I used a flavored extra-virgin olive oil. I had received some products to sample from Corners of Time, and their Meyer lemon olive oil worked beautifully with the mango, herbs, and curry powder. Also, I used arugula rather than watercress as suggested for the salad, but both are peppery greens well-suited to the fruity dressing, grilled chicken, and avocado. This salad was a snap to construct. First, the chicken was marinated for a few hours in a mix of olive oil, white wine vinegar, and Dijon mustard before being grilled and sliced. The dressing was made in the blender, and mango, cilantro, mint, curry powder, and salt and pepper were pureed. Then, with the motor running, olive oil was slowly added until emulsified. My curry powder wasn't particularly spicy, so I added a pinch of cayenne after tasting. Fresh mango was used here, but thawed, frozen mango chunks would be fine. 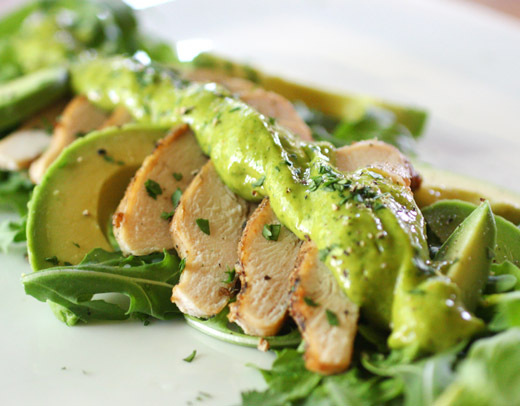 The salad was built with a layer of arugula or watercress topped with sliced chicken and avocado. The dressing was spooned over the chicken and a few herb leaves were scattered on the plate. The simple, few ingredients in the salad were just enough since there was so much flavor in the dressing. I was delighted with this dressing and its texture, and I started imagining other uses for it. It's thick enough that it could be used in place of mayonnaise in the regular kind of chicken salad. It would also pair well with crab or shrimp, and it would work perfectly as a dipping sauce. Obviously, I'll be pulling out the blender to whip up this dressing repeatedly all summer long. A fantastic salad! So fresh, summery and extremely toothsome. Oh my, this salad looks so exciting, Lisa! Just wonderful for Salad Month which happens to be in May! When I first looked at the photo, I thought "Where is the mango?" How fun that it's in the dressing! This is unusual and sounds so delicious! I'm definitely going to try this very soon! We're on the same page! That dressing looks like just the right texture to use as a spread on a sandwich or as the mayo-like base in another salad. It might also be excellent over scallops! Love love love the photo!!! This is a stunning dish! I'm ready for salads too! How light and refreshing, adore the mango with cilantro and mint. This salad would be a perfect weeknight dinner. I love eating salads. I will be putting this one on my list to make. Wish I had a bowl of this right now - looks amazing!!! Very interesting dressing, Lisa. A surprise that mango is the thickening agent. I'd love that. Your photos are so summery...making me dream of salads too! Oh man. You really hit the right spot with this recipe. look at all that avocado goodness. nice. i'm not often excited to eat salads...it just seems boring or something. but this sounds really delicious with the mango dressing! i will definitely be making this very soon!! I Love love love love love love this!!!! 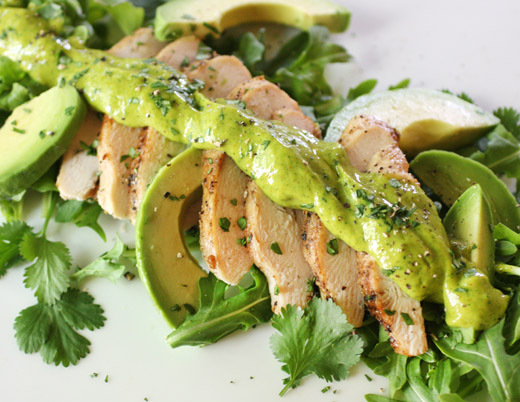 Chicken, mango, avocado! oh dear, I'm about to faint! gorgeous flavors! The dressing looks amazing! When I saw the avocado in the picture I thought you made a mistake but when reading the recipe I found out how you used in the dressing. The salad looks so packed of wonderful flavours. I want this SALAD too! The sauce looks out of this world delicious. Excellent salad! Bookmarking this, to try ASAP! Yum! Lisa, like you, I go salad crazy in the summer. So exciting to even think that we are nearing that sunny time of year. Just this past week we have started scarfing the "summer" fruits and I am thrilled to leave wintery goods behind. 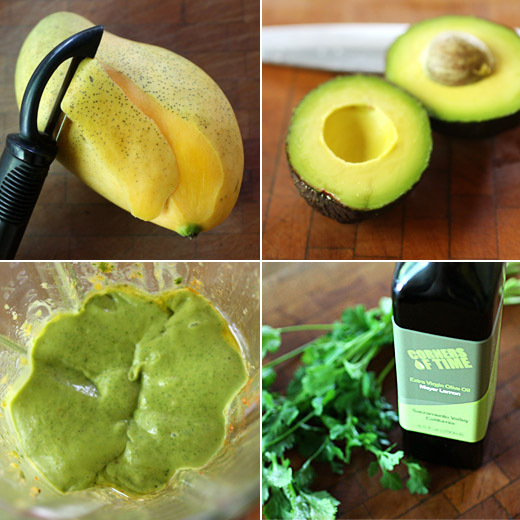 Love the blender dressing, looks creamy and divine. Lovely colors! I'm sure the mango in the salad dressing was really a knockout paired with cilantro. Salad weather does approach- pretty soon it will be so hot here you won't even want to think about turning on an oven. Definitely a good one to tuck away. We've been making our own dressings lately. Yours looks a good new find. The addition of the mango and the flavored olive oil sounds delicious. I love drizzling in the olive oil and watching everything emulsify in the blender. Boy, I've been in salad mode too. We've had a warmish spring - that must be why. Anyway, nice flavor combo here. I love mangoes in anything, so of course I like them in salad. Really good post - thanks. I like your mango dressing with curry powder hint of spice. It is almost like mango chutney with fresh herbs and then blitz for creaminess! I'm intrigued by this mango thickened dressing, it sounds so tropical with an avocado experience. I'll have to experiment with this. Say avocado or say mango and you will find me. This looks delicious. Oh, this sounds good. We're in the full throws of mango season here, and I want to try spreading my wings a bit. This sounds like the perfect place to start.